A deputy was injured after crashing his patrol vehicle during a high-speed chase in northeast Harris County. 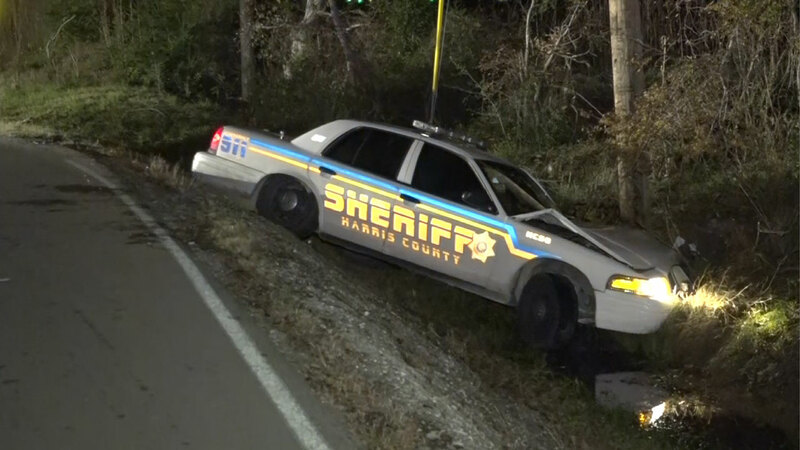 HARRIS COUNTY, TX (KTRK) -- A Harris County Sheriff's deputy was injured during a chase in northeast Harris County. It all started around 1am when the deputy spotted a driver speeding and gave chase, reaching speeds of up to 90 MPH. When the suspect failed to make a sharp turn at the intersection of Miller Wilson Road and Clara Wilson Road, his vehicle launched across the ditch and wound up in a pasture. The deputy who was following the car was unable to stop and ended up ramming his patrol vehicle nose down in a ditch. He went to the hospital in a patrol car, complaining of a sore back and knee. Miraculously, the deputy missed some power lines and a pole only five feet away. The suspect was transported to LBJ Hospital with neck and back pain. Investigators say the car he was driving was stolen.